SHENZHEN, China, Jan. 31, 2019 /PRNewswire/ — Grand Skylight Hotel, a renowned home-grown hospitality brand in China, has successfully launched her flagship hotel in Addis Ababa, the hub city of East Africa with world-acclaimed Ethiopian Airlines. This move signifies Grand Skylight’s international presence in Africa, and is an affirmative step in China’s Belt and Road Initiative, cementing Sino-Afro ties further. “The hotel’s ambience is great. 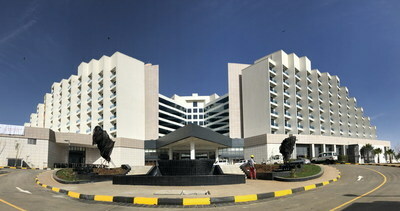 It’s contemporary, bright, and very luxuriously spacious, befitting a veritable landmark project in continental Africa,” H.E. Prime Minister Abiy Ahmed said amidst profuse praise. Ethiopian Airlines CEO Mr. Tewolde Gebre Mariam in his exalted speech briefed the guests about the hotel’s vast growth opportunities in the face of the exciting potential of local tourism and MICE market. He lauded the hotel’s pioneering team for their diligent efforts, and presented a personally signed Letter of Appreciation to the GSHM task force. The owner of the hotel project is Ethiopian Airlines, the largest, fastest growing and most profitable airline company in Africa, enjoying considerable clout and renowned internationally. GSHM is a wholly-owned subsidiary of AVIC with a registered capital of 298 million yuan. The company started its business in 1985 from Shenzhen Shanghai Hotel and has more than 30 years’ experience in hotel planning, construction consultancy and operations management. The company focuses on the mid-high-end hospitality sector. Up to now, the company has more than 60 hotels in China and overseas, and has ranked among the top 30 high-end hotel management groups in China.